Board luxurious L'Austral for this 13-day excursion through the high Arctic, visiting Norway's northernmost provinces in the Spitsbergen Archipelago. Glaciers, icebergs, fjords, and mountains dominate the landscape. Spot the wildlife that calls this rugged tundra home, like walruses, polar bears, whales, seals, and foxes. Get an unparalleled view of the Northern Lights from the charming coal-mining town of Longyearbyen, and marvel at the Monaco Glacier. In fact, you'll have the opportunity to hike across some of the most iconic glaciers of the Arctic on this exciting expedition cruise. From aboard the ship, you'll even see the impressive ice floes. 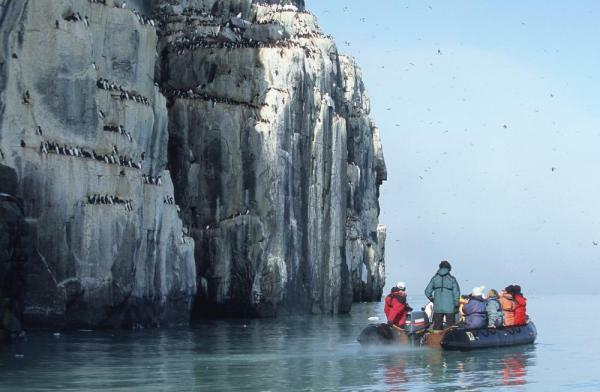 The Gnålodden Cliff culminates at over 700 meters high and is home to over a thousand species of sea birds. Tridactyl gulls, northern fulmars, and thick-billed murres are lords and masters in this often deafening commotion, particularly during the nesting season. 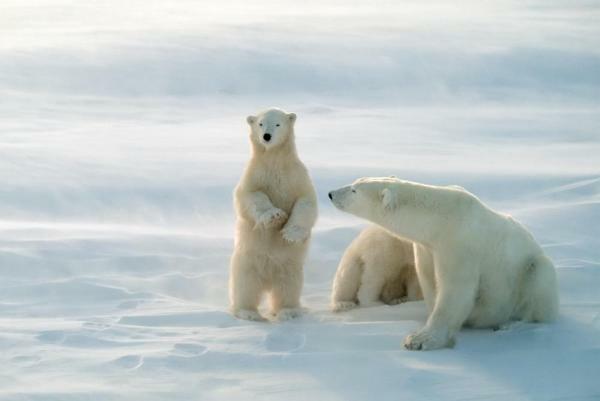 Polar bears and arctic foxes also frequent the site, a delight for lovers of the animal kingdom. The “bird cliff”, as it is known, is surrounded at its foot by very rich vegetation, unfurling its carpet of moss across a décor of wild tundra. During your visit, stop at the former hunter’s cabin, which was also used as a satellite station during the 1930s. Nestled between millennial glaciers and carved mountains, and considered to be “the crown of Arctic Norway”, Spitsbergen is a place that never sees the night. Your ship takes you closer to this fascinating archipelago and, more particularly, the Hornsund fjord. Considered to be Svalbard’s southernmost fjord, it is especially reputed to be its most stunning: at the end of its vast bay, 8 great glaciers slowly make their way down to the sea before giving way to the many icebergs elegantly drifting along its cold and mysterious waters. 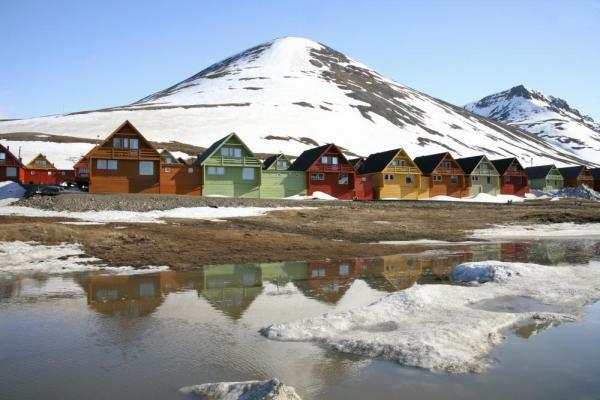 Located to the east of Spitsbergen, this bay has many surprises in store. At the entrance to the national park on the east coast, it is a region often taken over by the ice until late in the season. This preserved bay offers the opportunity to discover the assets of the High Arctic: the tundra, glaciers, and polar bears. Near to the bear den areas of Barentsøya and Edgeøya, this site often provides an occasion for great sightings of the local fauna. Located to the east of Spitsbergen, in Storfjorden, Agardhbukta is a former trapping site where a cabin remains. During your visit here, you have the opportunity to see the ice floes and explore one of the spots where the polar bears pass by to travel to Bellsund, on the western coast of Spitsbergen. The vast plains of the Agardhdalen area also offer the psossibility of long hikes to disover the High Arctic tundra. On the eastern coast of Spitsbergen, in the heart of an exceptional geological site, set off to discover the remnants left by the first to explore the region, the Pomors. These settlers, hunters, and trappers from Nothern Russia were the first to discover the Svalbard Archipelago, in the 14th century. At the time, they believed they had arrived on the coast of Greenland. They named this land “Grumant”. This port of call certainly fascinates history and geology lovers. On the southeast point of the island of Spitsbergen, Isbukta is a small bay that shelters an immense glacier, the Vasil’evbreen, whose front is more than 20 kilometers long. This is an opportunity for an unforgettable Zodiac outing. If the conditions allow it, you can land directly at the foot of this majestic glacier, so as to discover the moraine and walk on the first section of the glacier. Depending on the ice conditions, you may perhaps be lucky enough to approch Stellingfjellet, home to one of the largest guillemot colonies on the archipelago. Very close to the former mining town of Ny-Ålesund, set off to discover Kings Bay and the magnificent surprises it holds in store for you. Your ship sails in one of the most beautiful fjords in Svalbard: Kongsfjorden (the fjord of the King), a gateway to grandiose landscapes. Here, the snow-capped mountains are reflected in the water where superb icebergs try to outdo each other in their beauty, a delight for photographers. Bearded seals, reindeer, barnacle geese, and black guillemots frequent these places that have a unique atmosphere. Once you arrive at the end of the fjord, admire the Kongsbreen (glacier of the King) and its three characteristic rocky points, which take their names from three Scandinavian countries: Svea (Sweden), Dana (Denmark) and Nora (Norway). Your captain sails right up to the limit of the ice, to the edge of the ice floe. Weather conditions and state of the ice allowing, go out in a Zodiac dinghy for a unique experience in the middle of these floating slabs of ice. In addition to this grandiose journey through the middle of these floes with their cut and blue-tinged edges, sometimes over 2 meters thick, it is also often an opportunity to see a particular kind of fauna totally dependent on the ice floe: birds, seals, and polar bears. Sailing into Wijdefjorden guarantees you an unforgettable moment of wonderment. The particularity of this gigantic fjord is that it almost entirely separates the island of Spitsbergen in two, from north to south. Sailing in Wijdefjorden enables you to reach the Daghøgda Valley and go for an exceptional hike along an ancient glacial valley. At the end of your walk, reach two lakes surrounded by impressive vertical cliffs. It is an exquisite spectacle, in the heart of the Svalbard Archipelago’s longest fjord. Discover the thermal springs of Jotunkjeldene. Located in Bockfjorden, to the northeast of Spitsbergen, they offer sumptuous landscapes thanks to their geological and botanical particularities. You may be surprised by the site’s entirely brown and red décor, punctuated by a carpet of algae and moss. Surrounded by majestic glaciers, the fjord rests on the Sverrefjellet Volcano, which erupted 100,000 years ago and is now extinct. However, warm springs rise to the surface all year long. 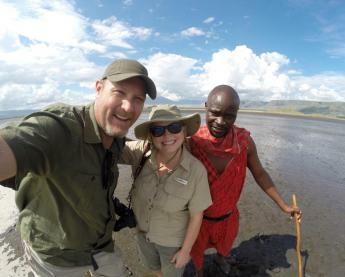 During your visit, do make sure that you walk on the surrounding moraine so as to preserve as much as possible the carbonate deposits formed by the springs, which are very fragile and subject to erosion. Located to the northwest of the Svalbard archipelago, the Monaco Glacier is probably one of Spitsbergen’s most beautiful and majestic. Named in honor of Prince Albert I of Monaco, a sailor, it stands as an impenetrable, blue-tinged jagged wall, the last glacier before reaching a latitude of 80° North. Imagine the sound of the ice cracking as it breaks free and crashes into the transparent water. To make the magical landscape even more perfect, you might be lucky enough to spot bears and whales, as these two animals have a special fondness for this area. Your captain sails right up to the limit of the ice, to the edge of the ice floe. Weather conditions and state of the ice allowing, you are able to go out in a Zodiac dinghy for a unique experience in the middle of these floating slabs of ice. In addition to this grandiose journey through the middle of these floes with their cut and blue-tinged edges, sometimes over 2 meters thick, it is also often an opportunity to see a particular kind of fauna, totally dependent on the ice floe: birds, seals and polar bears. At first sight, the small island of Ytre Norskøya seems to be sterile and arid land. But once you are ashore, you are welcomed by a thick carpet of golden moss, dotted with pygmy buttercups, Svalbard poppies, and lichen. On the beach are the remains of the ovens that were used to melt whale blubber, precious evidence of the history of the whalers who came and set up in this area as of the 17th century. Another trace of the past: the presence of one of the largest cemeteries in Svalbard, with no fewer than 165 tombs. The Ytre Norskøya cliff is home to many sea birds, including little auks, barnacle geese, Atlantic puffins, and thick-billed murres. Located on the western coast of the Lilliehöök fjord, Signehamna bears many traces of its past. Indeed, you see the remnants of a former German weather station that was used during the Second World War. In the heart of this sheltered bay frequented by many sea birds, abandoned cans, cables, and utensils just lie on the floor like historic evidence that visitors are asked not to touch. 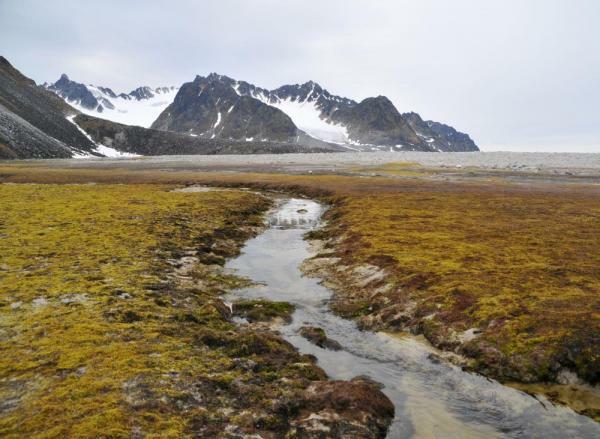 Around you, admire the mosses and lichens that are characteristic of the tundra as well as the very old plutonic rocks. A short walk enables you to enjoy a superb panorama with a view over the lake and a chain of snow-topped mountains. At the entrance to Cross Bay, between tundra, plutonic rocks, and mountains covered with a surprising endemic flora, set off to discover the 14th July Glacier. It was thus named by Prince Albert I of Monaco, following an expedition that he led there at the beginning of the 20th century. The glacier’s surroundings are frequented by numerous birds (tridactyl gulls, thick-billed murres, barnacle geese, common eiders, Atlantic puffins…), as well as arctic foxes and reindeer. As you arrive in front of the glacier, admire the impressive wall of ice and the reflection of the cliffs in the water. It is quite common to see a section of ice come loose, or a bearded seal lounging on an iceberg. 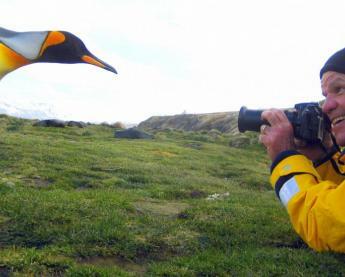 At the northern entrance of Isfjorden, there is a small paradise for bird lovers: the Alkhornet Cliff. It is home to a very rich avifauna, made up of thousands of birds frolicking in a joyous tumult: gulls, guillemots, pink-footed geese, terns, seagulls, puffins, arctic skuas… The Alkhornet Cliff, easily recognizable by its rhinoceros-horn shape, is also frequented by reindeer, which are not overly timid. Attracted by the tundra that covers the foot of the mountain, they come to graze in peace in a verdant setting covered with grass and moss. 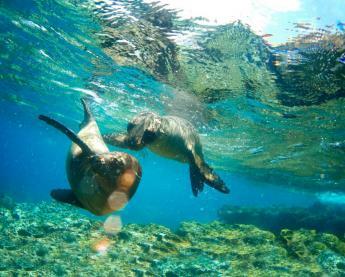 With a little luck, you perhaps have the opportunity to see some seals and Arctic foxes, who are also regular visitors. Situated deep inside Isfjorden, the Nordenskiöld Glacier is one of the very beautiful discoveries of your cruise. 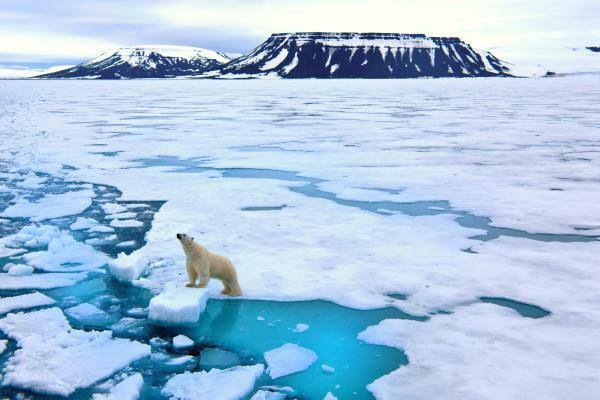 Its front of ice, nearly 5 km wide, is one of the most spectacular in the Svalbard Archipelago. 30 meters high, the glacier, like a gigantic frozen statue whose sections of ice sometimes come spectacularly loose, is impressive. The polar bear, the king of the Arctic, perhaps makes an appearance in these parts, which are also frequented by reindeer and seals.